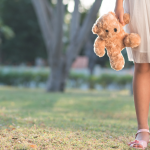 Gifted children often struggle with anxiety. 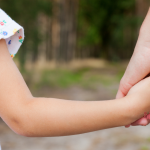 Here’s a look at why, plus 4 ways to help your child cope. Three weeks ago, my six-year-old started having panic attacks over the possibility of having swallowed lost toys. It began with a wayward Lego figure, whose legs she had been chewing on moments before. Flying Legos. Hysterical sobbing. General wailing and gnashing of teeth. It seems irrational, and if I weren’t living it I would probably laugh. But the truth is we’re a family of chewers, and my kids put all manner of things in their mouths. This child, in particular, is a frequent accidental ingester: we’ve swallowed gum, a small googly eye, four sequins, and a quarter. It was entirely possible she could have swallowed the Lego, but she did not: we found it quite fortuitously after it took a flying leap from the folds of her hair. I cancelled the alarm, talked my wallet down from the Emergency Department ledge, and lay on the floor with my worn out child. Sweat hung in waves on her forehead; her chest rose and fell in great heaves. I don’t know much about quantum mechanics. I’m pretty clueless when it comes to the migration of grebes. I have no idea what led up to Wat Tyler’s 14th century rebellion. I’ve been bedfellows with anxiety for ages. I know more about it than I would like to, honestly. 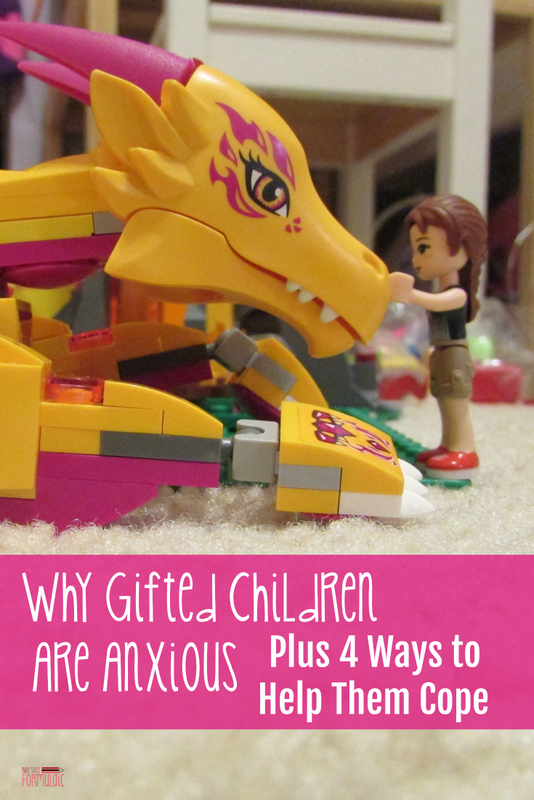 Gifted children are a bit of an enigma. For starters, there’s no solid definition of what giftedness means. Compounding this is a lack of definitive research on gifted self concept: some findings indicate a propensity for increased social adjustment; others suggest a deficit in social function and self esteem. My own perception falls within the latter category – I’m a mother to gifted children and a former educator of gifted tweens and teens. 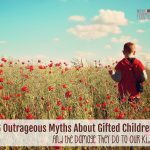 In my experience, it’s the traits we celebrate in gifted children – imagination, sensitivity, empathy, powers of observation, and higher level thinking – which lend themselves toward a deeper understanding of the world around them. Couple that with asynchronicity, perfectionism, and an acute sense of justice? You have the perfect recipe for global functioning hampered by anxiety. But at some point you begin to see the haze of Mordor on the horizon, and you’re unsure when the boundaries of the Shire got left behind. There’s insomnia, depression, angry outbursts, and withdrawal. You’ve crossed psychologist Dan Peters’ fine line between anxiety as “a normal byproduct of their…perfectionist drives [and] something…detrimental” to the process of their lives. This is the point where we grasp for an escape route, often yanking as hard as we can. But anxiety is like the Chinese Finger Puzzle of gifted parenting: the stronger the reaction, the tighter the hold of the weave. We have to empathize with our children’s experiences, model appropriate coping mechanisms, and make that practice a part of our daily routine. We have two extremes in our house. 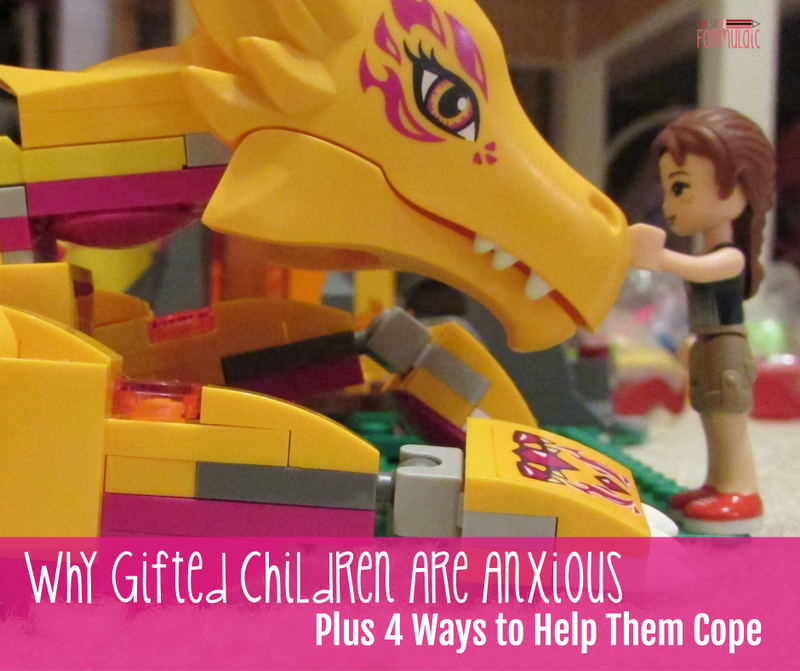 One child is vocal about her anxieties, while the other is more likely to hold it in till she breaks. 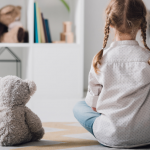 While their MOs are decidedly different, both benefit from expressive modeling – watching their parents manage their own anxieties and fears. We are up front and open about our problem solving, thinking aloud as we navigate setbacks and struggles. Knowledge of a thing increases one’s power over it, so we also delve into the biological origins of fear. We try to connect the feelings they experience to their physical sensations, then assign them a concrete, visible name. We’ve made Worry Monsters and worry jars; we’ve used role play to practice social occasions. The end product is a new way of looking at anxiety. It’s no longer something that controls them, but an aspect of life they can manage or move past. Gifted kids need an outlet – one not wrapped up in their own expectations or fears. For us this means physical activity like a walk or a bike ride, plus open-ended opportunities for creative expression and play. Gifted kids may be intellectual, but they are children just the same. They’ll be better able to manage their anxiety if they have a channel to move them past the brink. There are days when the anxiety’s so vicious we get nothing accomplished – nothing material anyway. I’ve shifted my expectations away from perfection. Sometimes schoolwork is neglected or the kitchen floor waits another day. What does get accomplished is the healing of my children. They’re more important than chores anyway. 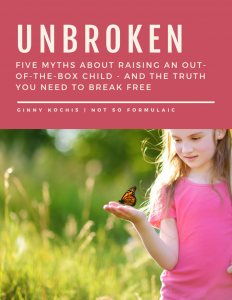 Ginny, this article offers some really wonderful insight into the lives of gifted children and how we can help them as parents. I think many people would benefit from your list of things to look for and ways to model good coping skills. I loved the idea of parents speaking their thoughts out loud when they are trying to work through something to help their kids problem solve through stressful situations- ( As long as their thoughts are positive and kid friendly). I’m a Pediatric Nurse Practitioner and I’m going to recommend that to my parents. Thank you! 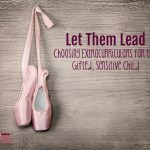 My twice-exceptional teenager is on medication for anxiety. Before that he would work himself up on a daily basis about such things as not being able to decide what to do with his free time and the fact that it would be getting dark soon. The medication takes the edge off but we still cope with this daily and I am not always as patient as I should be. Great insights and suggestions in this post–thanks! Medication can be a huge, huge help. Thank you for the reminder. Hello. After dealing with epilepsy misdiagnosed as panic attacks for 6 years in a very exceptional 11yo girl, all I have to say is that neurodevelopment is a very complex theme. We’ve also been through all sorts of treatments, from NLP, relaxation techniques, and of course medication which was our lowest point. Anxiety is triggered in a specific part of the brain which can be stimulated by the tiniest “malfunction”. I sincerely recommend to any person dealing with anxiety to talk to a neurologist. Certainly, yes, medical treatment is a very valuable, viable option, though I’m not sure every case of anxiety is a matter for a neurologist. I am glad you found an answer for your poppy. Thanks for writing this article! I felt like I was reading about my son. You touched on some points that definitely ring true in our home, like the worrying, which we are attuned to now at 11. I love the idea of the monster jar for things that he feels he will never be able to resolve but which are an ongoing source of anxiety. I’ve been toying with having him meet with a professional to work through some of this…it’s on my list. We’ve met with a professional for one of our children and it has helped. I neglected to add that in the post – I probably should go back and edit! This has been so eye-opening for me. I told you a few months ago that I suspect a few of my children are 2e, although we’ve never had a diagnosis, so I’m not sure. The way you described your daughter’s anxiety sounds sooo similar to some of my kids. They are always worried all the time about EVERYTHING. What if I have cancer? Will the microwave start on fire when I press start? Do I have a tapeworm? The worries are ENDLESS! Today my 10 year old was sitting in the living room with tears in his eyes. I asked him what was wrong, and he said he was thinking and he might tell me later. Sure enough, a little later, he was telling me that he’s afraid our family is going to be separated or that one of us will die. I was dumbfounded. I reminded him of the verse that says, “Do not be worried about anything….present your request to God.” Then I reassured him that God is in control. Anyway, sorry for this long comment, but you truly did help me figure out so many things just now. Oh Shelly. It’s so hard! I will pray for you as you navigate all of this. Amen! That is all. Hugs to all us mamas of these sensitive beautiful souls. Thank you, and hugs to you.